Cut your brocolli into bit sized florets. Prepare them by first blanching them in a boiling pot of water with a pinch of salt. Do not cook the brocolli for anymore than 2 minutes. Whilst it might not seem like enough once you grill it the texture will become perfect for eating. Once cooked drain the pot immediately and then place the brocolli into a bowl of water filled with ice to halt the cooking process immediately. Over a high heat place a grill pan and allow it to get smoking hot. Alternatively you can do this step on your barbeque on the grill section to get equally good results. Toss the brocolli in a small amount of olive oil and then place the brocolli on to the hot grill plate and sear, turning well when it starts to go brown. Remove and place into a metal or glass bowl. 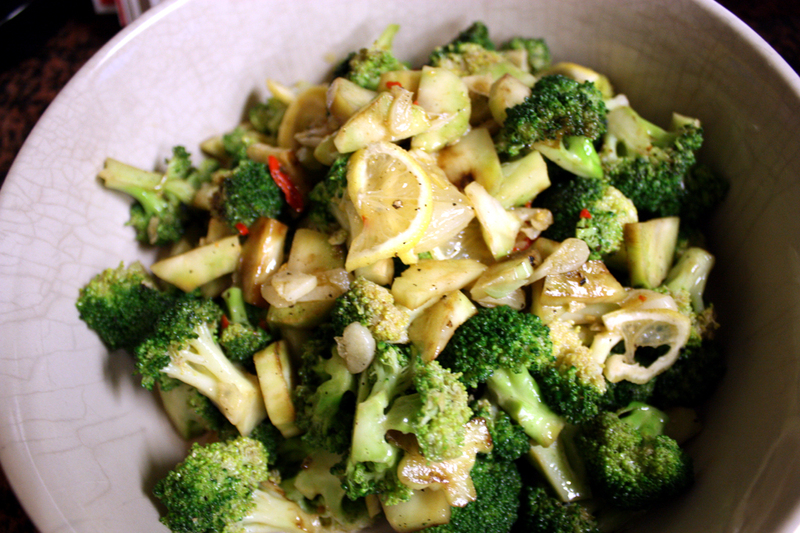 Once the brocolli is cooked you can prepare the dressing. Place the chilli and garlic into a small saucepan over a medium heat with the 100ml of olive oil and bring to a simmer and cook until the garlic starts to turn golden around the edges. Remove from the heat and carefully pour the hot infused oil over the brocolli. Add the finely sliced lemon and season generously with salt and pepper. Serve warm or cold.